The Syntor models are the oldest radios of the group. The Syntor radios are synthesized 32 channel radios for VHF high band and 440 MHz UHF. Manufactured in the 1980's, they were available in outputs from 35 to 110 Watts and with a wide variety of options in the Sys90 heads. The radio itself has very little in common with any Syntor X, Syntor X 9000 or Syntor X 9000E radios. 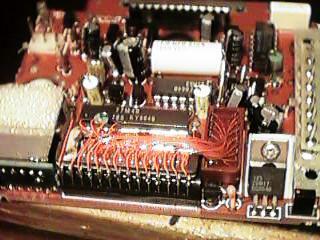 The Syntor radios do not have built in microprocessor control units, their early synthesizers did not have much of a frequency range and they use a 10.7 MHz first mixer IF. They are good solid radios. The receiver bandwidth is designed for up to 2 MHz (you can stretch them out more than this), and they have to be hand tuned even within their original factory coverage, as well as programming the PROM when you set them up. Some Syntor control head accessories will work on the Syntor X radios, but, many will not or need modifications to do so. The Syntor X models are a step up and are the foundation the Syntor X9000/9000E radios were built on. These radios have internal microprocessor control units, better synthesizer ranges and use a 53.9 MHz first mixer IF (the low band uses 75.7 MHz). Unlike most other commercial narrow bandwidth radios that need retuning, these are true wide bandwidth radios that do not require retuning within the entire factory bandwidth. They use System 90's accessories and can use some Syntor/Micor/Mitrek System 90 accessories, but, they are totally incompatible with Systems 9000 Syntor X 9000 / 9000E control heads and accessories. The could also be programmed with the Epson HX-20 programmer. See the Epson page for more information. The MCX100 is its own beast. It is basically the same guts as a Syntor, but in a different package. The programming and tuning is all the same as a Syntor, but the control head for the radio is a totally different setup. For the multi-channel units, the control head uses a rotary channel knob with a LED channel display. The MCX100 was the basis of the MCX1000, which offered full microprocessor control and digital display features. The MCX100 is packaged into a chassis that is somewhere in size between a Maxtrac and a MCX1000. It is quite tight to work in, but you can still perform the EPROM modification used for the Syntor, with a bit of creativity. There also is a MCX90 as well. This is virtually the same as the MCX100, with less channels. If you want to check out a wealth of information on all of the Syntor line, check out Mike Blenderman's site. Paul Bennett has some additional information on both the MCX100 as well as the Syntor. The microphones used by the MCX100, Mitrek, Micor, the MX Converta Com, and the older Syntors are all the same. The pinout can be found here. 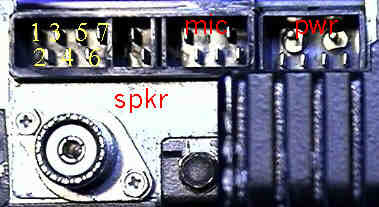 Note that some microphones may or may not have the hangup switch and associated pin. If you want to see the full schematic of the typical microphone, then look here. To use your Syntor VHF/UHF in the ham bands may require some modifications, click here to download modification instructions. The Syntor and MCX100 both use a bipolar PROM (one time programmable) for the programming and must be burned with a PROM (suitcase) programmer. If you want to create an image file to burn a PROM for a VHF Syntor, for use in a regular EPROM programmer, you can try this freeware program. If you want to create your own EPROM layout for programming a MCX100, check here. You can convert from the PROM used for programming, to a more commonly available 27C16 EPROM (any burn it with any compatible device programmer). To see the details of this modification, you will want to check here. This modification is written for the Syntor, but it does work with the MCX100. The problem with the MCX100 is that there is no room in the chassis to plug the adapter into the old PROM socket. What you have to do is cut a notch in the logic board shield and remote mount the new EPROM into the control head cavity using a piece of ribbon cable soldered to the pads for the PROM on the solder side of the logic board. You also may want to beat on the chassis cover a bit with a hammer to allow some room for the ribbon cable to pass over the edge of the chassis without getting damaged. Beats trying to get a PROM programmed! If you are really good at working in tight places, you may be able to get the 27C16 to fit inside the MCX100 chassis without modification. See these pictures of the MCX100 EPROM Adapter and its location for ideas. Since the MCX100 is such a nice, tight, radio, it works well for packet radio. The modification is the same for either UHF or VHF. This modification works on "dash" mounts as well as "remote" control head versions of the MCX100 radio. 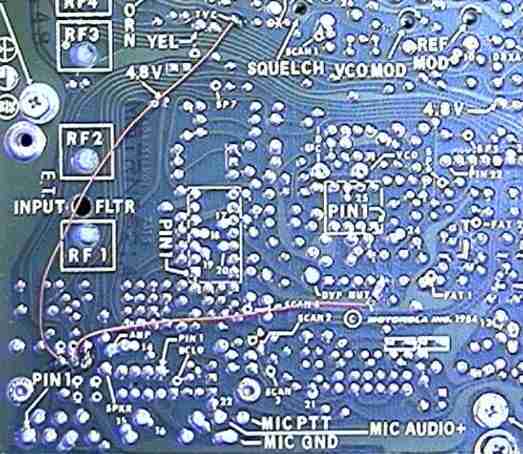 Click to see a view of the main board on a MCX100. The rear of the radio is towards the bottom of the page. If that doesn't look like your board, then try this one. The connection to the TNC is made using the 7 position accessory plug, part number 1584193M01 and some 0984151B01 pins to go into this plug. The pins come in a pack of 20. The tool that allows you to remove the pins from System 90 plugs, such as this seven pin housing is a 6684690C02, I recommend you get one of these. The receiver audio is obtained from the TOP OF VOLUME CONTROL, or TVC test point. 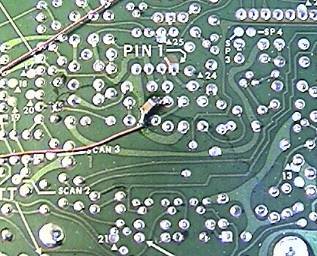 This closeup shows just where a piece of small wire (red #30 wire wrap wire in this view) is soldered into the plate- thru hole on the main board next to TVC. 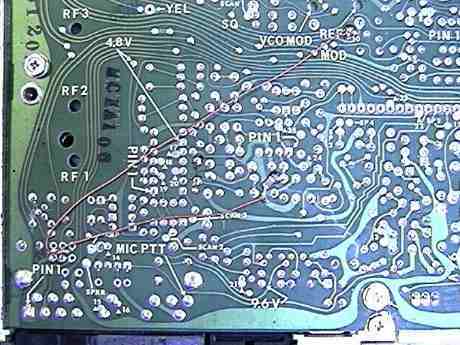 The older MCX boards didn't have a TVC silkscreened onto the board, so you have solder your wire here. The receive audio at this point is constant, and is squelched audio. This wire runs down towards the rear of the radio, to a cut jumper that leads to the 7 position options plug. 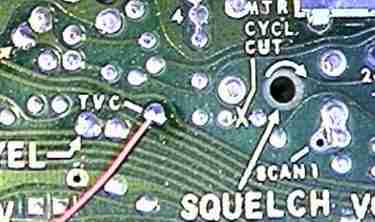 This view shows the transmit audio being connected to a series resistor and cap, then soldering to a pad on the main PCB. 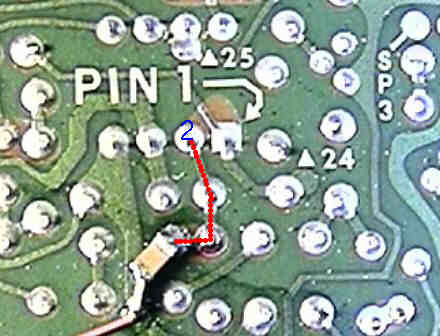 The actual connection point is pin 2 of the eight pin IC chip (pin 1 is the square pad shown in this picture). The resistor value ranges from 100 ohms to 1K, mainly depending on the amount of drive from the TNC, and the cap is typically a .1uf chip cap. 1/8 watt resistors do work in place of the chip resistor. One note here. The value of the cap will effect the response curve of the transmit audio, the lower in value the cap goes, the more it "favors" the high frequency (2200hz) tone. Your board may be slightly different, check this view to see if it matches. The cap is shown laying flat, and the chip resistor is on its edge, connected to the end of the chip cap. This view, and the alternate, show the relative position of where the cap and resistor combo are located. 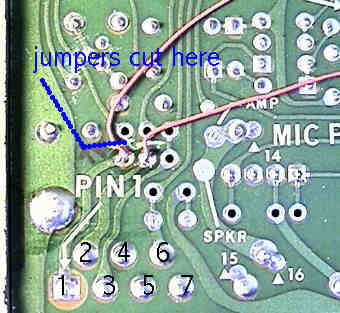 This view shows two jumpers that are cut (JU351 and JU352), and the wires that solder into the holes that go directly to the external pins. The receive audio is present on pin 1, the transmit audio is on pin 2. The pins count in a staggered arrangement from left to right. 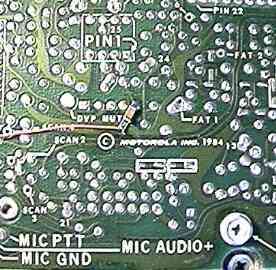 Motorola's R1801 programmer will not program the Syntor radio out of the commercial band. However, there is a way to do it by a little skullduggery that is quite simple. 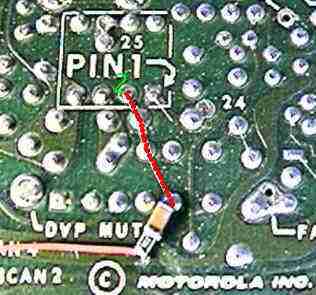 To get the radio to transmit out of band you have to make the VCO use a offset of 10.7 mhz by connecting the PROM pin #15 to the other side of the PTT inverter which is found under the top lid pusher spring. There is a 4.7k resistor there and the end toward the PROM is the one that you want to use or check and see which end responds to PTT. 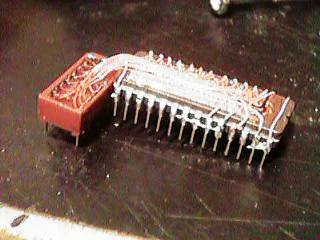 Just bend pin #15 out and plug the PROM in and jumper pin #15 to the 4.7k resistor. In order to make this work, you must program the PROM backwards by making the RX inputs for TX + 10.7 and TX inputs for RX + 10.7. Be careful not to get them reversed. The actual frequency will be 10.7 mhz lower than frequency entered. The receiver will be high side injected. If you can understand this, it is a simply transposed the VCO from RX to TX as the TX frequency is used for high side injection for the RX and the TX frequency is the injection for RX frequency + 10.7. This may be confusing but think about it and you will see why it works. This extends the range of the radio down 10.7 mhz by doing this. The other problem would be the PL's. We don't have a way to program the PL PROM and the only other way is to use a ComSpec 32 PL generator or use your imagination. This has been proven to work and you can program 32 channels into the radio. If you have any question about this modification, email AlexK6LPG@JPS.NET. To program the Syntor X you also need the R-1801 suitcase programmer. Decoding your model number may be accomplished by looking here. For Syntor X users we have a treat for you! Click here for a freeware Syntor X programmer. NOTE: This programmer is meant for the 2m ham band. It has had the bandsplit opened up to cover 140-190 MHz but not all frequencies may work (Motorola does some goofy calculations here and there). We have not tested it or played with it (we don't have a Syntor), use at your own risk. Another freeware Syntor X programmer is available from http://msuarc.egr.msu.edu/syntorx/. Paul, N7OCS, can help you if you need to program the above radios, contact him at pbennett@macnet.com or visit his web site at http://www.geocities.com/SiliconValley/5857. Another source of help is Sandy, and you can contact him through his web page. 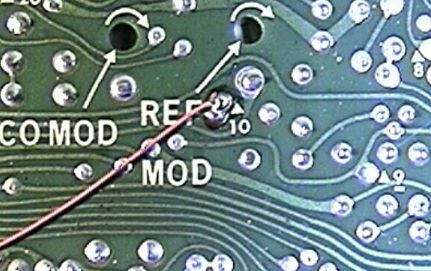 If you want to do something entirely different with your Syntor, check out this modification for computer control from Piexx. There is another new method that has been developed to allow frequency agility to the Syntor and Syntor X without having to program the original EPROM. More information can be found by checking out this site http://www.K3JLS.com. It should be cheaper and simpler to use than the Piexx modifications (above), but it also doesn't have all the advanced features.